100 Recipes from Sardinia to Sicily to cook at home! Join Gino on his trip to the islands of Sicily and Sardinia on a journey of discovery of authentic and delicious Italian food. Delving into the gastronomic history of these islands he will uncover the signature dishes, and secret recipes that encapsulate Sicily and Sardinia and their people. The illustrated recipe book features dishes from Olbia on the North Eastern edge of Sardinia, to Alghero on the North West of the island, famous for its Spanish influences. Ranging from authentic Northern dishes from the mountains, to delicious Southern Sardinian seafood dishes, GINO’S ISLANDS IN THE SUN encapsulates the essence of Sardinian food, famed for promoting longevity and healthy way of life. Next stop Sicily, and Gino’s recipes explore the street food of the vibrant city of Palermo. These beautiful dishes capture the rich history of the ancient town. Recipes incorporating the famed Marsala from the Sicily’s coastal region pay tribute to the islanders who create it and export it all over the world. Including 100 mouth-watering recipes – using fresh ingredients and regional specialities – GINO’S ISLANDS IN THE SUN reveals the culinary secrets of these beautiful Mediterranean islands. 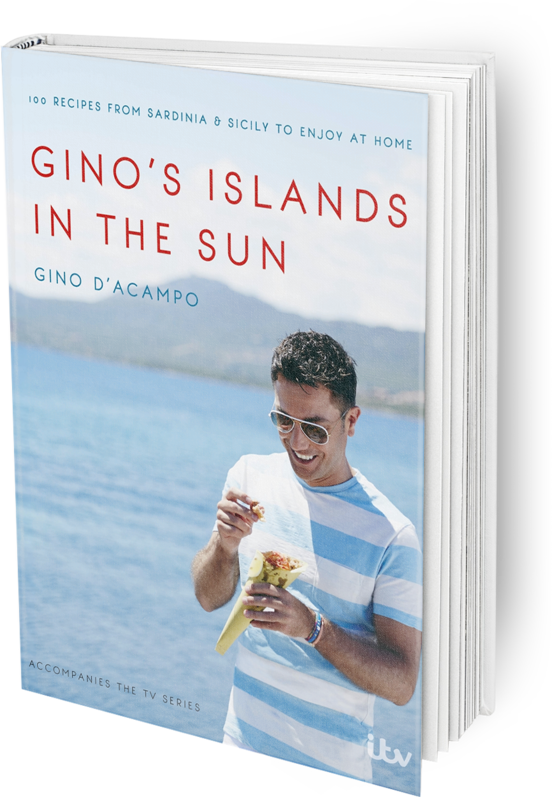 Click below to buy Gino’s Islands in the Sun or to view recipes from Gino’s Islands in the Sun.